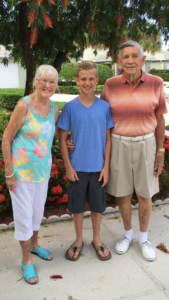 I’m Robert A. Susdorf, a 91-year-old World War II veteran who was an electrical engineer and technical manager for 40 years. I have always been very active and have kept busy with projects. In the past ten years, I have had 2 Aortic valve replacements, prostate cancer (now in remission), Melanoma skin cancer (surgically under control), and now Multiple Myeloma., as well as miscellaneous surgeries (lung, hernia, and disc fusion). I have C.O.P.D., congestive heart failure, and neuropathy. I felt weak, had low energy, tired quickly, was light headed, and lost a lot of my small motor skills. After two months of taking Re:immune daily, my body has changed remarkably. I feel more awake and stronger. I have much more energy and enjoy doing physical things. I feel mentally sharper and more awake which makes my life much more enjoyable. I’m amazed at the effectiveness of this product! There has definitely been a spike in the last few weeks of all sorts of nasty bugs going around. Today we want to share a little knowledge about the mineral zinc and how it can become your ally in the fight against these nasty bugs during cold and flu season. Our bodies rely on zinc to support immune function, cellular activities and more than 300 enzymatic functions. Zinc also combats inflammation in the body. It’s essential for healthy hormone and immune development, as well as human growth. This is why it is especially important for pregnant women, babies and children. It is essential for cognitive development and regulates hormones such as leptin and cortisol. As important as it is, around 2 billion people worldwide are deficient primarily due to inadequate nutrition. Another factor is high sugar and carbohydrate consumption. When the body has an unhealthy blood sugar balance, the body cannot properly absorb zinc. For people suffering from leaky gut syndrome the inability to absorb zinc is common. Zinc deficiency can cause a host of problems in the body, including. . .
Zinc is known to be helpful in boosting the immune system to prevent catching colds and also in shortening the duration of a cold. Studies have shown that taking zinc within 24 hours of the onset of symptoms can shorten the length of a cold by several days. A significant amount of colds are caused by rhinovirus which thrives in the nasal passages and throat and multiplies quickly. It has been found to be effective at preventing the rhinovirus from multiplying and may stop it from lodging in the mucus membranes of the upper respiratory system. Our clinical strength hydration supplement, re:iimmune, addresses the core reasons people struggle to recover from an illness: dehydration and malnutrion. Good hydration is critical when recovering from any type of illness. In order to properly fight against all these nasty germs we need our immune systems at the top of their game. Since 70% of our immunity is in our digestive tract we’ve included a prebiotic and probiotics in re:iimmune to support the intestinal immune system. Balancing electrolytes, L-glutamine for tissue repair and zinc are all included to get you better, better! The change of the year has us thinking about how changing your routine or adding something new into your life can be unsettling or invigorating or perhaps a little bit of both. 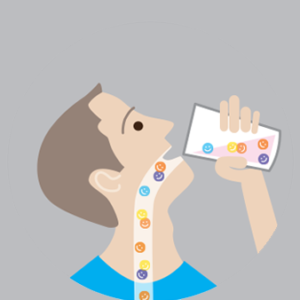 Even something small, like adding re:iimmune into your routine to better improve your gut health and stay hydrated can seem like a huge commitment. You might be thinking “I’ve got a thousand things to do in a day. What? Now I’ve gotta remember to drink this too?” Don’t laugh! You know what we mean. All of us are creatures of habit but it takes some of us a lot of time, effort, reminders and information to fall INTO those habits. So today we thought we’d give you some ideas on how to kickstart the habit of making re:iimmune part of your day and inspiration from some of our customers on why you should! “As a Registered Dietitian I am always on the lookout for superior nutrition products that are supported by evidence-based medicine, and have found a keeper in re:iimmune. I often find myself becoming dehydrated throughout my busy workday, when things become so hectic it’s easy to forget to drink or eat anything! It’s a snap to mix up some re:iimmune and instantly feel recharged- and it tastes great, too, not like some other supplements that contain artificial sweeteners and a chemical-laden aftertaste. The nutritionist in me also likes fact that there aren’t extra calories from added sugars- it’s really just good, simple, nutrition- and can be enjoyed by diabetics or others who are controlling their carbohydrate intake. 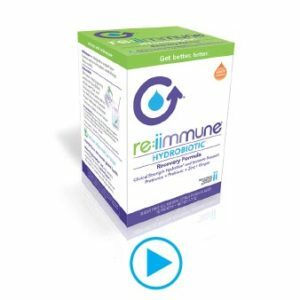 Knowing that re:iimmune contains probiotics and L-glutamine, both proven to support intestinal health, makes me feel even better about drinking it and recommending it to patients, especially those on low-fiber diets or with gastrointestinal disease. re:iimmune contains just the right ingredients whether you’re recovering from an illness or just trying to stay healthy! And did I mention it tastes great? !” Stephanie B. “I have suffered from IBS since I was a teenager, I know how important “gut health” is so when I heard about re:iimmune I knew I had to try it. I have used it for a couple years and I love it. Every morning I drink a full glass of it, so it helps rehydrate me and the probiotics keep my gut in check. Since starting on re:iimmune I have not had any IBS issues, even in situations that would otherwise cause a flare up. I also have shared the product on numerous occasions with my elderly parents when they have had the flu and or have to take antibiotics and it has helped them recover faster and like me, my Dad thinks the salty flavor is great. So, why re:iimmune…because it is all about taking care of yourself, being healthier, and living an active life style with NO side effects.” Paula T.
“I was first introduced to re:iimmune by a friend, when I was feeling under the weather one day. Back in 2009 I had gastric bypass (weight loss) surgery. I have kept off about 80 pounds of that weight loss. One thing that weight loss surgery patients must be very attune to, is their hydration levels. Some who have had this type of surgery can dehydrate faster than the average person, and it can be much more dangerous, sometimes even sending people to the hospital for days of re-hydration I.V.’s. Living in the great state of Texas where summer temperatures easily reach over a hundred degrees for several days in a row, I must stay acutely aware of my water intake. Any time I feel like I’m not quite there with my hydration, or I’m feeling tired, I just drink a re:iimmune and in about 30 minutes, I feel completely refreshed and recharged. I feel so glad that I was made aware of this wonderful product and I always keep a box on hand. I’ve recommended it to friends as well! While I may not be the type of consumer using this product for a more serious medical issue, I think it’s good to get the word out that this is extremely useful for the “average” consumer; i.e., after having been out in the heat all day, etc. Everybody needs re:iimmune. Thanks for creating this great product!” Angie M.
So as you can see, people have so many good reasons to add our hydrobiotic recovery formula into their routine! Now how do you go about turning that into a habit? We found this awesome article on lifehack.org “18 Tricks to Make New Habits Stick” by Scott H. Young. We’ll share a few of his recommendations below but then we highly recommend you click on the link above to read it in it’s entirety because his suggestions are spot on! Happy New Year everyone! Are you up for a little challenge? We know you’ve been making all sorts of resolutions about being healthier in 2017 and we’d like to give you some reasons to take part in the 10 Day re:iimmune Challenge! We hope it serves as a jump start for your entire wellness routine. First of all, it’s the 10 Day re:iimmune Challenge because there are 10 packets of re:iimmune in each box and we are encouraging you to use it for 10 days in a row to get a real sense of it’s benefits. It’s a water-based solution for drinking which provides Clinical Strength Hydration® with a rich package of health-supporting ingredients. This unique combination has been specifically formulated to help you get better, better. Re:iimmune is formulated with balancing electrolytes to help provide maximum rehydration, probiotics to help support the immune system. It also contains a prebiotic to help promote the growth of good gut bacteria, L-Glutamine to help repair tissue, ginger to assist in reducing nausea and zinc to promote immunity. This unique combination has been specifically formulated to help you get better, better. Whether you are starting from a relatively healthy place and just want the additional support or if you are struggling with recovery of illness we hope you’ll consider our 10 Day re:iimmune Challenge. Drink your re:iimmune every day for 10 days. In forming a habit, it typically helps to pick a certain time of day for the task. So start off with it in the morning, make it part of your lunch routine or your after work snack; whatever time of day works best for you. Remember to mix the packet with 16 oz of water and it’s best cold, so add an ice cube or two if you like. Don’t chug but also don’t sip so slowly that you forget about finishing it. When your 10 Day re:iimmune Challenge is up, we’d love to hear from you about your experience! Email us at info@makepeoplebetter.com. We have exciting news! Your road to recovery just got shorter as re:iimmune is now available at Walgreens here in southwest Missouri. You can find our Hydrobiotic Recovery Formula at Walgreens locations in Nixa, Ozark, Springfield, Branson, Hollister, Marshfield, Bolivar, Neosho, Republic, Carthage, and Branson West, Joplin, and Webb City. This is especially good news as we are right in the thick of cold and flu season! Did you know that 70% of your immune system is in your digestive tract? Hydrobiotics addresses the core reasons people struggle to recover: poor hydration, poor immune system, and intestinal inflammation. re:iimmune gives water the super-power to help from the inside out. Cells need to be adequately hydrated to function, and immune boosting properties need to encompass protective intestinal barriers from unwanted bacteria. Dr. Kerri Miller created a Hydrobiotic recovery formula that has proven scientific results to improve the growth of beneficial gut bacteria, reduces inflammation and hydrates the body at a cellular level. You can read some great tips for staying well and boosting your immune system from Dr. Miller on livingbetter50.com. At the same time you are helping yourself feel better, you are giving that gift to another person in need! Through the Get Well Make Well program, a serving of re:iimmune will be donated for every box purchased to organizations who work daily to improve the health of under-served populations and catastrophe relief. 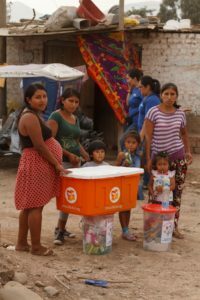 Every year a half million children under the age of 5 die from dehydration and millions more suffer from poor intestinal health and malnutrition. 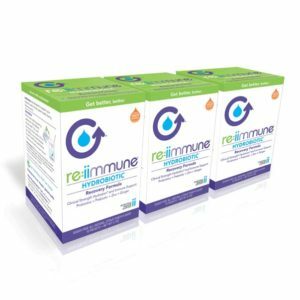 Your purchase of re:immune helps you to “get well” and simultaneously helps “make well” the life of another. To date we have donated 120,000 servings world-wide through Convoy of Hope. We are thrilled our product will be available at the Walgreens locations mentioned above and that more people will be able to get better, better with re:iimmune! What are probiotics and prebiotics and how do they affect digestive health? The human digestive system is full of both good and bad bacteria and when all is working well, the good bacteria help to keep the bad at bay! Inside the digestive tract there are trillions of microorganisms working to keep the balance and keep the entire body healthy. An imbalance doesn’t just cause gastrointestinal and digestive issues. Our gut health is connected to brain function and mood, skin health and our immune system. Probiotics are living bacteria and yeast which live in the intestines and help balance out bad bacteria in the digestive system. We ingest probiotics through foods like yogurt, kefir and aged cheeses such as bleu, gouda and cheddar. You can also get probiotics through soybean products and brined and fermented foods like pickles and sauerkraut. However, all on their own probiotics can only have a limited effect because they are easily destroyed in our system. Probiotics must have particular sources of food in order to flourish and that’s where prebiotics lend a helping hand in digestive health! Prebiotics are not living bacteria, they are forms of fiber which act as food for probiotics. Legumes, beans, bananas, berries and vegetables like tomatoes, onions, asparagus, and greens are all good sources of prebiotics to add to your diet. Often a good diet is not enough to keep a good balance of probiotics and prebiotics in our systems and a supplement can be of enormous benefit. Especially if one has been taking antibiotics which can kill off a number of good bacteria, if one has contracted food poisoning or is recovering from an illness. The latter was one of the driving forces in the creation of re:iimmune. We want to help people get better, better and two of the best things you can do for your digestive health when your system has been thrown out of whack for whatever reason is to stay hydrated and keep your gut in good health! 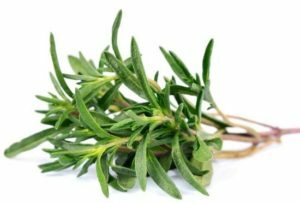 It is in this spirit that we present re:iimmune’s new blog series “Whole Foods Spotlight” where we will focus in on a specific whole food, its nutritional benefits and provide you with a few links to some tasty recipes that may inspire you to add more of that particular food into your diet. 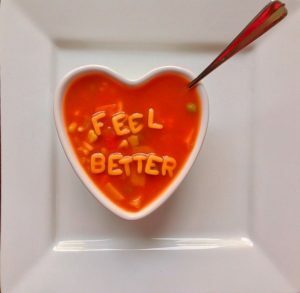 After all, good health begins with good nutrition! With Halloween just around the corner, it’s a perfect time to talk pumpkins! Fall means pumpkin flavored everything and we’re totally on board! That said, lattes and pumpkin spice muffins do more for you spiritually than they do nutritionally speaking. Even though 90% of a pumpkin is water, that other 10% is packed with a wealth of nutritional benefits. We hope to inspire you to add more of this great gourd into your diet and reap the rewards! The oldest pumpkin seeds found so far came from Mexico, dating somewhere between 7000 and 5500 BC, so it’s believed that the plant is indigenous to North America. However, pumpkins from that time are not the round orange varieties we carve into jack o’lanterns today. Rather they were a crooked neck variety which stored well during long winters. After maize (corn) was introduced, some Native Americans began a clever planting technique known as “The Three Sisters.” Corn and beans were planted together so that the beans would twine their way up the corn stalks. Pumpkin and other gourds were planted at the base as the plant’s large leaves helped create shade and hold moisture to the roots of the companion plants. Like carrots, pumpkins contain carotenoids which give it that orange hue and support healthy eyes and better night vision. Studies have shown that carotenoids also provide some protection from cataracts and age related macular degeneration. The pumpkin is also rich in beta carotene which has been shown to reduce cell damage and improve immune function. They are also a great source of magnesium which is important for energy levels, a healthy nervous system and strong bones and muscles. Finally, one cup of pumpkin has a whopping 245% of recommended daily amount of Vitamin A! We decided to skip over the zillions of pumpkin dessert options for our recipe suggestions since we know you’ll get your share of those lattes and slices of pumpkin pie this season. 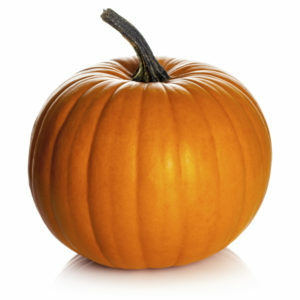 Instead we’ve opted to give you some links to more savory ways to get more pumpkin in your diet. Enjoy! Do you resemble the picture above? Shorter days, hectic school schedules and the parade of upcoming holidays can leave us feeling zapped of energy. As we all fall back into the rhythm of autumn and winter, we at re:immune want to remind you of natural ways to boost your energy, immunity and overall health. With a few healthy habits, the fall and winter seasons won’t leave you feeling so drained. Lack of sleep or poor sleep really messes with our bodies and minds. 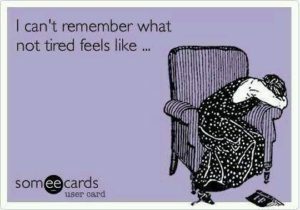 Chronic sleep deprivation causes an imbalance in the hormone cortisol which leads to us feeling sluggish in the morning. So first and foremost, to have more energy during the day, you need to try to get the optimum amount of sleep at night on a regular basis. This typically falls between 7-9 hours a night for most people. Have trouble falling asleep? Our senses are. . . well, very sensitive when it comes to getting those zzz’s, so be sure check the temperature of the bedroom. A room temperature of right around 68 degrees Fahrenheit is optimum. Also, exposure to too much light in the bedroom can also throw off our Circadian rhythm and make for a poor night’s sleep. Finally, be aware of how noise pollution might be affecting your rest. Sirens, noise from streets and highways and other sounds might be affecting your sleep patterns. Look into a white noise machine or repetitive nature sounds to help soothe your ears and lull you to sleep. Obviously this is something we are always talking and thinking about at re:iimmune. In a stressed state such as dehydration, the cells of our intestines are impaired. This means that sodium, which is crucial to proper functioning of the body, cannot be effectively absorbed. Our formula was designed to help people recover from mild to moderate dehydration. We also included probiotics to help balance digestive function. When it comes to sleep, serotonin is an important neurotransmitter for regulating the sleep/wake cycle. Most serotonin is made in the gut and so keeping the digestive system operating at it’s best helps keep the body in balance. A healthy diet plays an important role in your energy throughout the day. Remember how tired that hefty helping of pasta left you feeling? Try to limit carbohydrate consumption which can leave us feeling sluggish and blah. Instead, get plenty of energy dense foods into your diet. Apples, bananas, blueberries, almonds, chicken, eggs and fish are the stars of the food pyramid when it comes to leaving you feeling full, satisfied and full of energy! Weight of the world on your shoulders? Push it off before you hop into bed. Some people find that making a to-do list or writing out their worries prior to bedtime helps to keep that wheel that is spinning in your mind on lockdown. Make sure your bed and pillows are keeping your body in proper alignment during sleep and it never hurts to have super comfy bedding and pajamas! Massage is also a wonderful way to put your body into a state of relaxation for sleep as it increases serotonin levels. Plus it’s beneficial in creating energy throughout the day as it aids in blood circulation, delivering oxygen to all of the cells throughout the body. Several essential oils are known to give us a little lift when we need it. Peppermint, spearmint and grapefruit oils can be added to unfragranced lotion and carrier oils such as Sweet Almond Oil to hydrate your skin and give you a bit of a boost all at once. Finally, and most importantly, get outdoors! Natural sunlight is essential for our health and well being and you can read a little more about the topic in our blog post from last week entitled “Top Three Benefits of Spending Time in Nature.” Take time during the day to go outside, take a walk, breathe deep and increased energy is sure to follow!